1) First start a true wiki of Ogre terms ( ogre lexicons can be good starter lists ) ANYONE in here can edit . 2) Improve this : http://www.ogre3d.org/tikiwiki/tiki-ind ... chitecture . Schemes In Computer Science are SOOOO GREAT especially when you don't use English natively so you don't have to translate all those sophisticated phrases when building mental model of what actually given API set does and works . Two pictures is too Little !!!!! 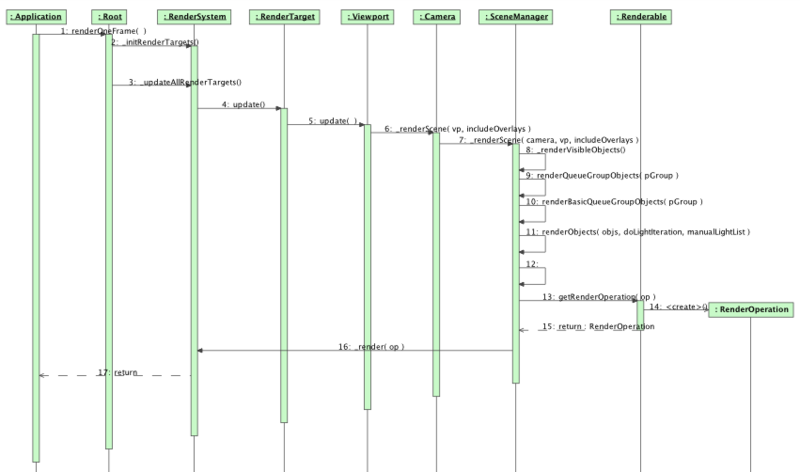 I would select a few OGre3d subsystems like Memory Animation General Resources Materials Math Effects Overlays Scene Image RenderSystem LOD RTShader and run an UML reverse engineer code , which does CODE -> UML SCHEMAS , example like this : http://www.visual-paradigm.com/ . 1) There is a wiki http://www.ogre3d.org/wiki/. Anyone with a forum account can edit it. 2) The page must be completely rewritten for the release of Ogre 2. By "true wiki" I guess you mean mediawiki, which is really just one implementation of the wiki concept. Personally, I'd rather have the Ogre team focus on code and have the community rally behind and play catchup with documentation. This is what I'm used to from an open source project. And if an infrastructure switch were to be considered, which I don't think is necessary, I'd say Confluence is miles ahead of mediawiki for software projects. c6burns wrote: I'd say Confluence is miles ahead of mediawiki for software projects. Pardon, my English bad , what does confluence ( of community and users ? ) has to do with mine idea of mediawiki . Confluence is a wiki engine too, but designed for software development. Anyway, personally I wouldn't change the wiki engine right now (except if it was easy and not time consuming). Excuse me , I wanted to create a separate encyclopeida wiki for that purpose . Do you mean you want to have another wiki along with the current one? What would be the use of the second one? Providing encyclopedic entries of Ogre terms , classes , programming concepts etc. Since encyclopedic basically means "comprehensive", I see no reason you can't help contribute to bring the current wiki closer to that definition without any change to its infrastructure. Unless your definition of encyclopedic means "like wikipedia in that it uses mediawiki infrastructure" in which case I feel the proposal is doomed to meet with disapproval. I feel like your problem with the wiki is content related, but you are *saying* it's infrastructure related. paul424 wrote: Providing encyclopedic entries of Ogre terms , classes , programming concepts etc. Most programming concepts are just graphic hardware concepts, so you should first be familiar with that (and C++ obviously). Doesn't the API documentation helps with terms and classes? Kali : APi documentation has no hyperlinks , it's short , it does not contain any minimal code examples , schemes etc. etc. Plus it does not appear immidiatly, but you have to unreaveal this bloody >>more << button . Hmm imagine a fresh person going to study Computer Graphics , and come across small encylopedia , which combines articles with small examples using real , graphical engine in C/C++ ! Who would like to have such intro into 3D computer graphics, if you haven't know the topic already ? I would love for sure ! And would be willing to study more advanced topics with it ! paul424 wrote: Kali : APi documentation has no hyperlinks , it's short , it does not contain any minimal code examples , schemes etc. etc. I don't know which API doc are you using, but my doxygen doc has a lot of links. Donno why do you abort a good idea from a start ? What would happen if new people woudl have additional source of OGRE information/ documentation ? Can you make a small survey of how many people would support such wiki media project ( that is editing etc. ) if there was one ? Nothing prevents you to create one and see if it works. Sure, but if there are no links to it from that site no one know it exist == it dies at the beginning. So if I start a wikimedia service you would link it from here, right , along with Forum Rules , ogre3d, Addons F. , Wiki etc. ? I don't get why to setup a second wiki for that, too. Seriously... Why is one Wiki not enough? Anyone can edit it, and write anything they want. "We want one, two, three big toasters per continent where people bring bread to be submitted for overnight toasting. That makes a worldwide market for twelve, maybe sixteen toasters. Who does eat toasts , anyway ? Wait ... what millions of people everyday ? Kill our marketing specialists ! " paul424 wrote: Sure, but if there are no links to it from that site no one know it exist == it dies at the beginning. Feel free to create your own wiki. I'm sure it's possible to set a link on it. But I think you have to create the content by yourself. I won't add content to your wiki, because I think the main wiki is enough. So who could improve that , Should I consider it as vaild graph of rendering loop in Ogre3d ? I really would like to see the Ogre rendering pipe scheme, some SceneManager API methods are criptic to me . Last edited by paul424 on Tue Dec 03, 2013 12:26 am, edited 1 time in total. wait, you're saying you want to have to search millions of toasters in the morning to find where your toast is? In this old joke Toaster == Computer. Probably allusion to non-interest of IBM in personal computers till the PC standard .